The round-the-clock media coverage of the events in Boston is understandable. Our anxious minds find something soothing about information — even if the news is scary — because we want desperately to understand what’s happening. We want to know that everything will be okay. We want to know the bad guys have been caught. At the same time, the media’s relentless analysis can give the impression—particularly to children—that the world is a terrible and frightening place, and we are all just one-step away from harm when we walk out our front door. For that reason, it's important for us to highlight the positive aspects of this story as well. Not in a Pollyanna-way that suggests everything is fine, but in a real way. It’s necessary to talk about the people who have opened their homes to others, sent food to first responders and provided an outpouring of support and kindness to those in need. I hoped that explanation would ease her into the realities of life. Yes, sometimes bad things happen. Really bad. But there’s also good in the world. A lot of good. Young children should be shielded from violent or graphic imagery on television and the Internet. They need to know that they are safe, secure and protected by the adults around them. Older children might have questions about the event and why it happened. Answer their questions and explain the details without getting overly sensational or frightening. And keep in mind that we adults can be easily overwhelmed by the constant barrage of news too. For me, as I follow the media’s coverage, I am reminded that terrible things happen in life. I grieve for the families and the community affected. 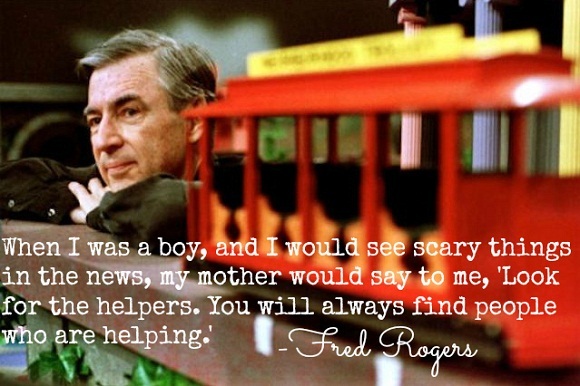 And then I think about the courage, bravery and kindness of the people who helped. I think about the good in this story because it's always there. Darlene Mininni, PhD lectures on media psychology for Touro UniversityWorldwide. Dr. Mininni holds a PhD in Clinical Psychology.